Aunty Karen said Skinny was not at all sure he liked the whole bathing process. He was working it a little undone by the whole thing and convinced his grandmom that he needed a good snuggle when it was all done. Here is a closer up shot of Skinny after he had his bath. Doesn't he look good!!! Celebrating freedom of fence, leash and rules! But not without a halter! I'm fast! Hi folks. 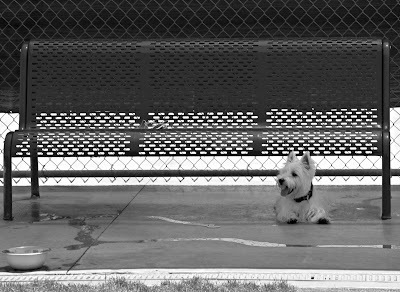 We are celebrating freedom which means no fences, no rules, no leashes! But if you're in the city better stick with the leashes! It's the law!! I am enjoying family and the outdoors today. Great snuggle time with Patricia Cartwright Pruitt my grandmother who seems to insist on this halter. Grrr... the Brits made these things really well cause i can't even chew it off! Pool time was great with my family. 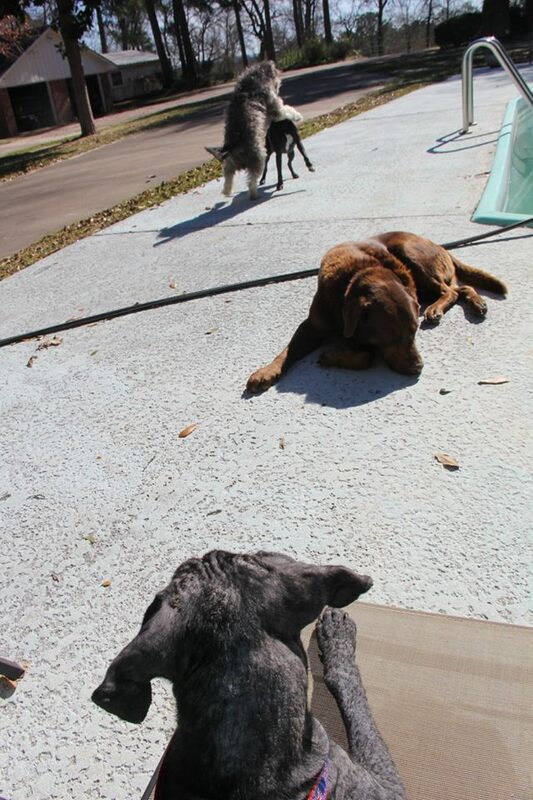 Winnie and Lexie ruff housed while I lounged with Dudley. We were getting our tan on. (no sunburn... i'm kinda sensitive with all my exposed skin so we went in early). I loved trotting around in the sun and being free! So be free pups, be free. And don't Judge anyone by the color of their skin, the condition of their skin or even for their mood. Sometimes ya just never know what they've been through that day. I love all of you for not judging me for being smelly, skinny and a bit crusty. You make me feel loved regardless of it all. Mom says she thinks we are witnessing a miracle and IT FEELS SO GOOD!!! Life is good, puppers. Life is good. "I got an A+!!!!! I've put on 3 pounds, infection is way down, still need to stay off the bad leg and let it heal more. Doc took me off pain meds as it was obvious I'm trying to run, jump and play so in pain free. My BFF James Lindstrom checked me out and his sidekick Annie Robison too. They both received lots of skinny pup kisses for all their help and concern. Doc said that everywhere he goes...coffee shop, card game...folks ask after me! Wow. Makes me feel great! Even Doc... seemed happy with my progress. Just gotta respect the healing process and stay off stairs, no jumping, and no playing with other dogs AND that sure is hard to resist since my house is full of fun furry friends. Even Tiger our cat likes me. I'll post a few more pics of my walks today. I don't put weight on my leg cause when doc showed me the pin in there I knew I better take it slow. Skin is going to be scrubbed tomorrow. Me and mom are getting in the shower and I bet I get her more wet than me wink emoticon. I'm cheeky like that. Life is good today as they say and I hope it has been for all of you too. If not, you're in my prayers. Keep hope alive!! If I can recover anyone can. See you peeps tomorrow and thanks for your love and support. Signed Skinny Pup quoting Zac Brown lyrics." "Who ME????? Well folks I learned another word, BAAAAD Boy! Yep I was enjoying my freedom in the house and the moment struck. What's a boy to do? Pee!!!! Mom said "we don't do that, we're English". Back to my condo/crate for my timeout session. Think there may be a few more of these in my future. Enjoy this beautiful Saturday! Hoping the memory is short with mom. wink emoticon signed, skinny pup behind closed doors." Needless to say, when everybody saw the associated picture (Those eyes!!!) they ALL told Aunty K to let Skinny Pup out of puppy prison and she did. I think his "time out" lasted 2 nano seconds and then he was back in Aunty Karen's lap. 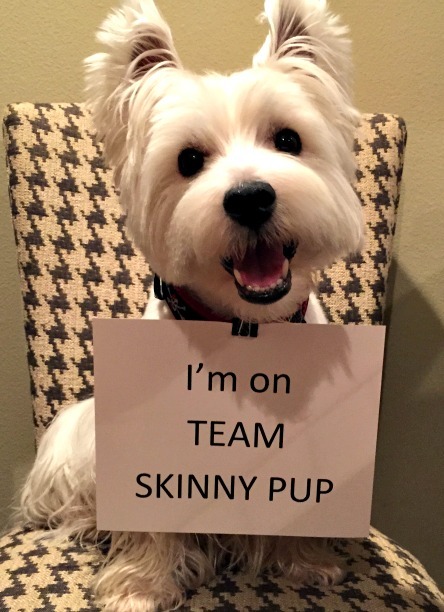 Way to harness the power of social media, Skinny Pup!!! Still waiting to hear who got wetter in the shower ... my guess is Skinny won that round, but I will let you know if I hear any final results. Mom here. I know you like to hear from Duncan, but I wanted to tell you first hand what it was like meeting Skinny. It was awesome. It was shocking. It was sad. It was heartwarming. It was heartbreaking. It was delightful. 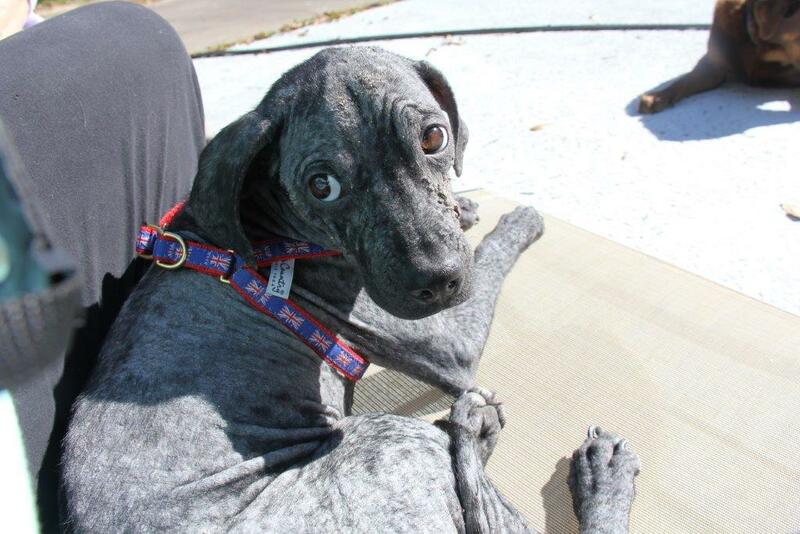 Skinny is at one time in such bad shape -- bony, furless, and frankly a little stinky -- and at the same time so full of joy. 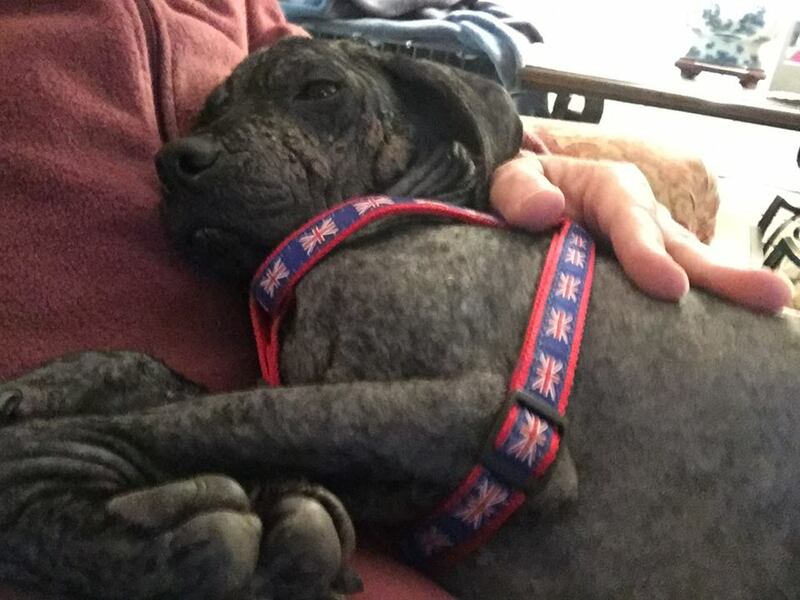 My impression is that Skinny has started to feel good enough, and safe enough, to let himself relax a little bit and be the 6 month old puppy that he is. I think Skinny got a bath, some good meals, surgery on his leg, ALOT of loving, and has kind of forgotten the mange, broken leg, scary times alone in the wilderness. Skinny is a 6 month old pup. Skinny bit on my arm a little bit with his puppy teeth. Skinny stole the toy Duncan sent for his girl Sophie and ran around taunting her with it. Skinny explored everything. Skinny desctructo'd the tail of the toy I took him with his puppy teeth. Then Skinny started bring his toys over to me and sitting in my lap with them. Be still my heart. Skinny trusted me to love him. Skinny knows what safe feels like -- he can discern it for himself now. And then Skinny rolled over for a belly rub. Totally exposed to the world, and fine with it. 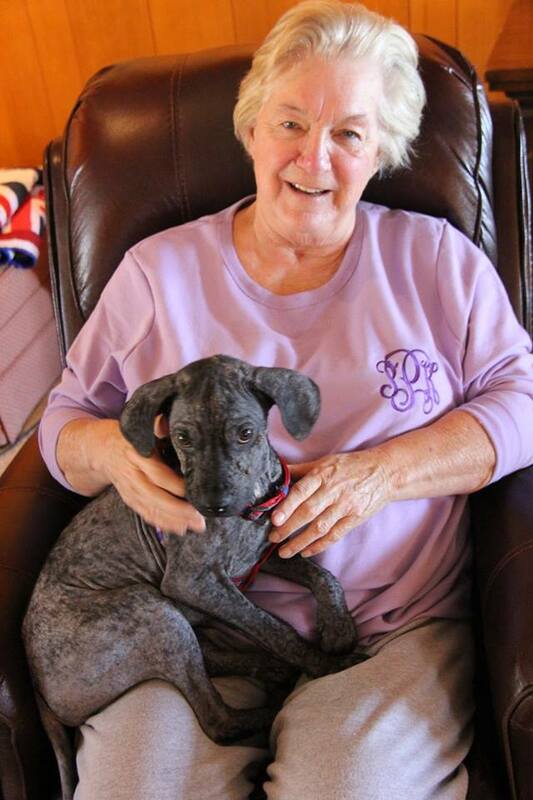 And may continued blessings rain down on Aunty Karen, Sharon, Grandmom Pat the rest of Team Skinny Pup. There is good in this crazy world. Some of you were surprised to see MOI yesterday and not Skinny. Normally, I would be shocked by that, but given Skinny is pretty cool, I am going to let it pass this time. The link to the Go Fund Me Account is here. The link to the video of Skinny's first media event is here. I really, REALLY hope this link works for everybody, because you will get to meet Aunty K in person and Skinny in the not so much furs if you watch it. Seeing these two in action is heartwarming. And, now, the reason why yesterday's post was MOI, not Skinny was because Mom was busy. This time, forgivably busy if you will. Mom went to meet Skinny!!!! Tune in tomorrow for the details!!!! Skinny had his (likely first) 15 minutes of fame last night! I saw the interview in a live stream, but there is no link to it that I know of. If I find a way to post it here, I will. Aunty K did an awesome job of getting the word out about taking care of your pups and doing the spay/neuter thing. There was some video of Skinny in action and it was nice to see that he does move around pretty well, albeit on three legs right now. He still holds his broken leg up. Aunty K has never really posted any full body shots ... he is a TALL DRINK OF WATER (maybe his real name should be Stilts?) but he is all bones. Really. All bones. All skin. No hair for the most part. Sad to see, but when you see him moving around and seethe sparkle in those eyes, you get a glimpse into the future and just know that he is going to be OK! 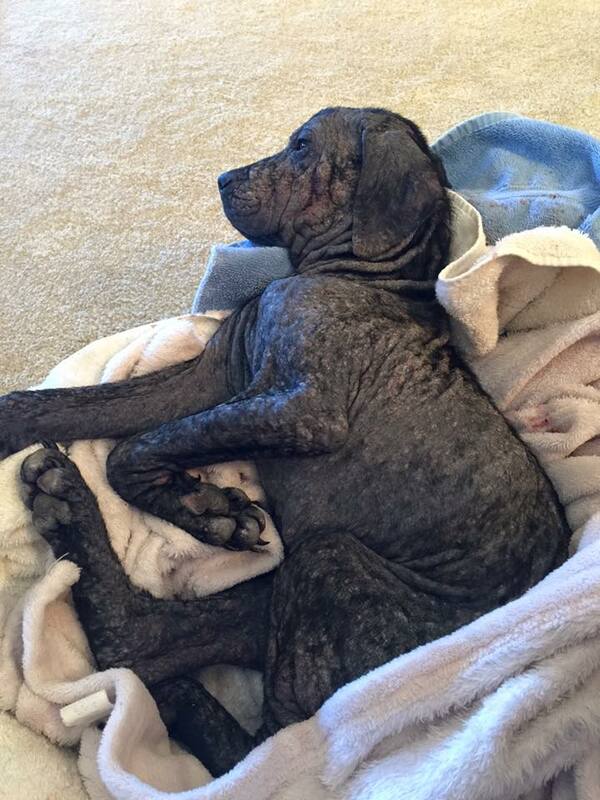 Aunty K said in the interview that when she went to get him, Skinny was curled up behind a tire. She got out of the car and started talking to him and he crawled, crawled, over to her. To me and mom It sounded as if he knew if he could just make it over to her he would hit the jackpot. Aunty K did say that Skinny is starting to be a bit more active which is a NO NO until his leg gets better. He is supposed to be staying pretty still. We may need to pick up the pace on POTP for Aunty Karen -- to give her patience as she tries to deal with a pup who needs to be still but is starting to feel better so he wants to be active!!! Oh, boy! Skinny here after a busy day with my new friend Malcolm J. Hornsby. Great guy! Aggie too!! He wanted to talk to me about my story so mom and I did an interview which will air tonight on KTRE 9 lufkin nacogdoches news at 10:00. I'm kinda getting into this media thing and have discovered Apps. KTRE 9 has one that streams live! Cool. Hope my wrinkles don't look too bad. Cause I'm doing better everyday. I even caught myself running and playing with Pippa today. And I'm not suppose to do that but I'm cheeky like that. Mom was not pleased. But she forgave me. I've been eating good, sleeping well and getting lots of quiet time with family. Life is getting better all the time. Signing off to take a snooze before my debut! Sure hope they got my good side! 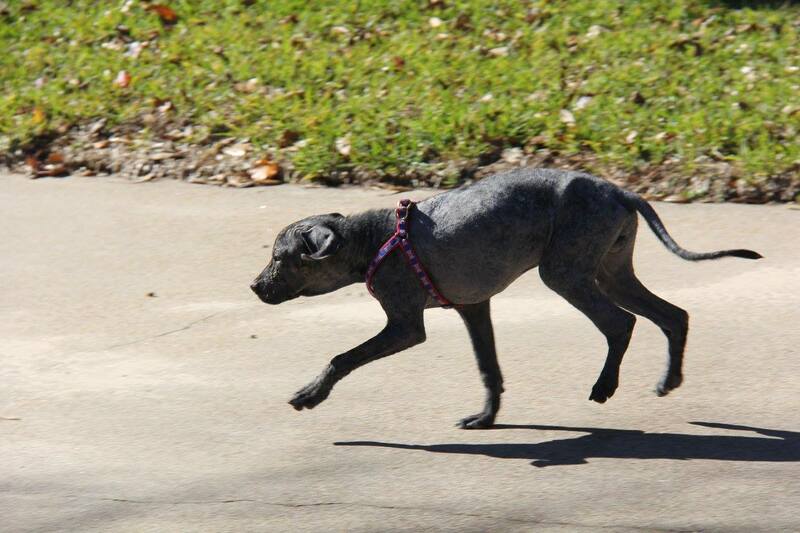 Signed, skinny pup enjoying 15 minutes of fame! Well look who is home and doing really well! 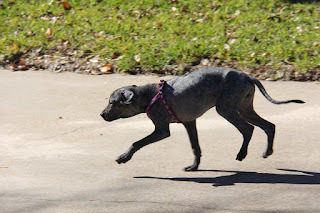 Go Skinny Pup, Go! Skinny came home Friday afternoon and, from what we can tell, has spent most of the weekend in Aunty Karen's lap. I understand he learned a lot about football on Saturday. He may be wishing the TEXANS had won because the house would have been much quieter. Imagine how different his life will be by playoff time next year!!! The last report we got from Aunty Karen was that in addition to being an excellent snuggler, he is eating, "doing his business", and enjoying lots of downtime in his crate and in her lap. He still has a long road ahead of him, but I think from the pictures he looks better already. Don't you? We understand his first interview with the puperazzi is later today. We'll keep you posted on that and if we can get a copy of the interview, I'll have my assistant try to post it here. Not sure that will really happen (good help being hard to find, and all that ....), but maybe She can at least figure out how to post the link if we get that. And, guess what?? 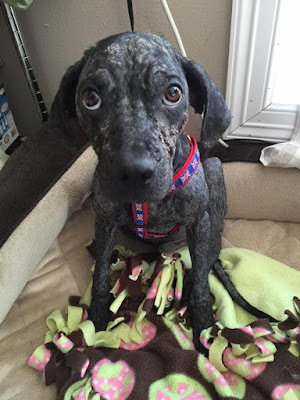 Skinny Pup has a secret angel who sent him his first box of treats and toys. He's got a new roommate in his crate these days!. Can't wait to hear if they figure out who it is! Some of you have asked if there is anything more you can do to help. There is a gofundme page that has been set up for those of you who would like to help financially. Keep up the POTP, puppers. Blessings continue to rain down on our New Year's Eve Angel! Aunty Karen visitng Skinny Pup Thursday afternoon. Skinny Pup attempting a selfie with Aunty Karen. Keep that POTP coming, puppers. It is working!! GOOD NEWS, Puppers. Skinny Pup did fine in his surgery last night. Here is a little of what he wrote on Aunty Karen's Facebook page after surgery:Hi there Pups and Peeps I MADE IT THROUGH! I'm drinking water, a little whoozy but I'm a survivor. Thank you guys for all the good love vibes! My vet put a pin in my leg but we're not 100% sure I'm going to be catching frisbees anytime soon. I likely need to be a very quiet, immobilized pup for a bit. My skin has been treated with antibiotics (Ivomec) so it should heal the infection but my skin and hair might take a few months. Aunty Karen is meeting with the doctor tomorrow so we'll know more details then. For now it sounds like the big concern is infection. The new mantra in our house is NO INFECTION FOR SKINNY PUP. NO INFECTION FOR SKINNY PUP. Thank you, thank you for the POTP. Please keep those prayers and positive thoughts coming! You all remember my Aunty Karen with the GINORMOUS heart who totally adores me, right? Well. 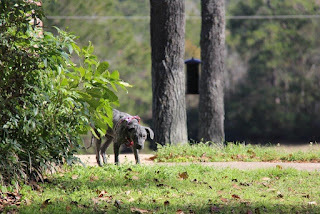 On New Year's Eve, Aunty K got a call that there was a pup in real bad shape along the side of the road. 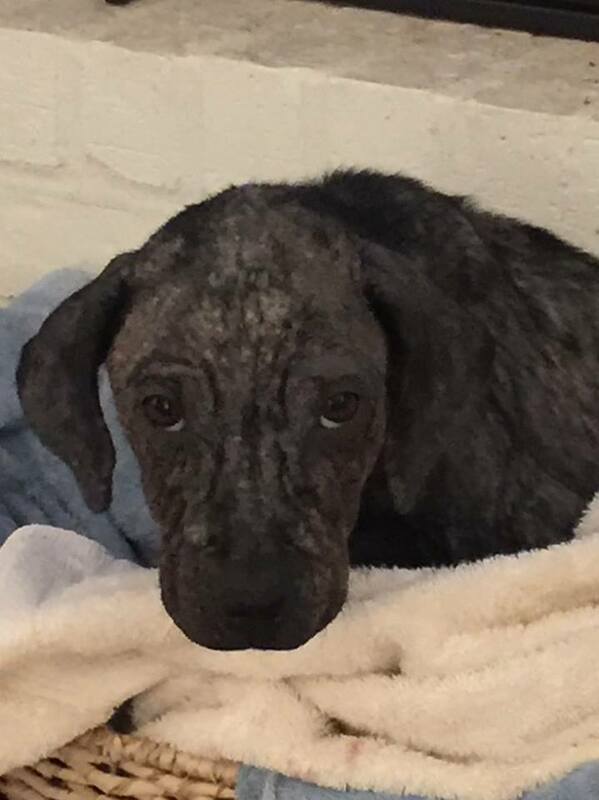 Aunty K offered to go get the pup and take it to the SPCA for loving care, but the SPCA people told her they were so, so sorry, but they did not have any space available for anymore pups, even one as special as this one. Well, we all know what happens next right? Aunty K said "Welcome to the Bar None Ranch (her house), Skinny Pup. We are going to take awesome care of your skinny little self. We will get you some spa treatments for that wrinkly bald skin and a pedicure for your bad paw, feed you a few gourmet meals, and you will be good as new." Skinny Pup might be skinny but take a look at the size of those paws!!! 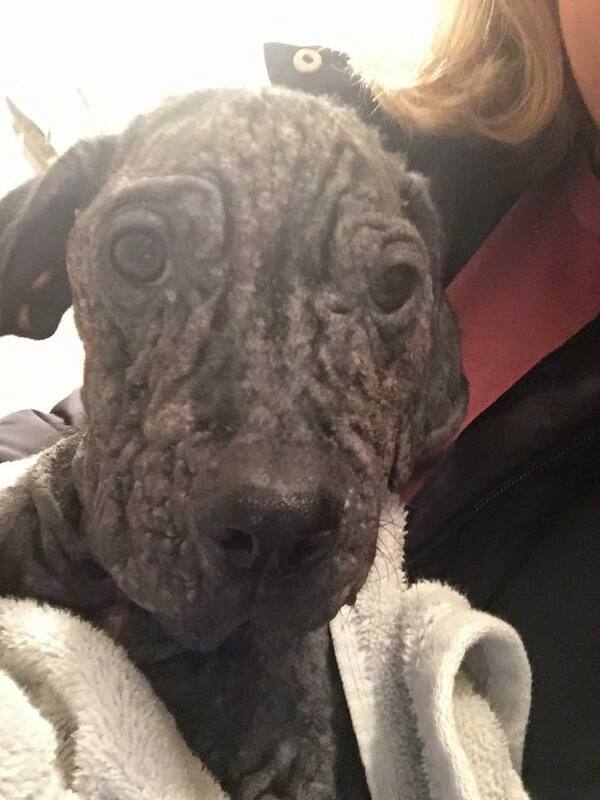 So, before he knew it, Skinny was wrapped up in warm blankets, getting teeny tiny meals of chicken and broth. He also go a special bath, spent hours in Aunty K's lap, and was later whisked away to the vet for a check up. 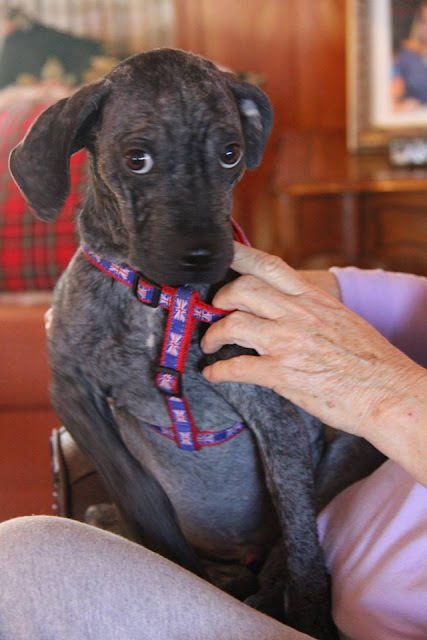 Aunty Karen posted some updates on her Facebook page and Skinny Pup, little by little is starting to feel better. His biggest issue is a broken leg that needs some pretty quick attention. Here is where we all come in puppers. Can you do me a REAL BIG LIKE HUGE favor and send Skinny Pup all the Power of the Paw, positive thoughts and warm hugs you can muster today. He is going to have surgery on his leg and because of the condition of his skin, there is a big risk of infection. You can tell from looking into those gorgeous giant eyes that skinny wants to feel better and spread some love. 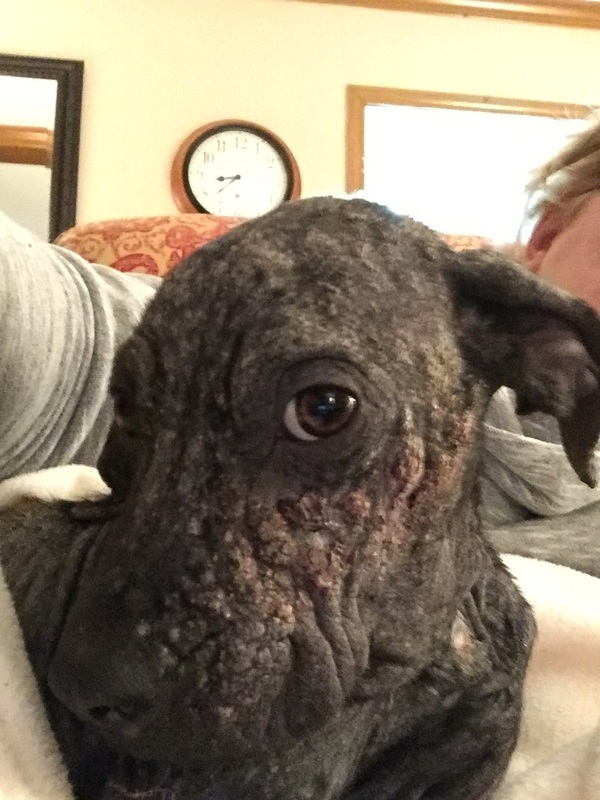 This is the first step in a long road to recovery for a dog that has had a tragic start -- I sure would appreciate it if you'd keep him in your thoughts today! We wish you a JOYful new year, puppers. 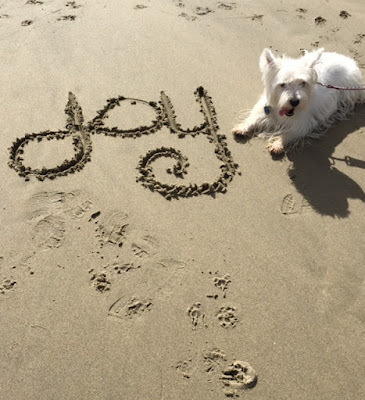 Mom says JOY is going to be our "word of the year" this year. As in, seek more JOY in 2016. She also says that when you look up JOY in the dictionary, you see a picture of me at the beach. Here's hoping this all bodes well for lots of sand and surf time for me this year puppers! And wherever you and your peeps find joy, may you visit there often in 2016!